Over the years, pins have flourished as both a collectible and as an artistic platform, and at PinPics we believe in encouraging collectors to embrace pins as examples of creative achievement. We wish to nurture the advancement of pins, in the belief that some of these pieces stand as works of art and warrant treatment as such. Hopefully by doing so, pins can be elevated to their deserved place within the collecting community. Using this framework, PinPics is also attempting to explore the progression of characters through pins. As pins have allowed the artists to continue narratives offscreen, this has in some cases enabled an expansion of the characters themselves. Our intention is to examine the avenues created by the artists which have allowed characters to further develop and evolve by way of pins. Pin trading began in 1999 during the Millennium Celebration at Walt Disney World, quickly spreading to all of the Disney parks. It made collecting and trading pins a legitimate global hobby. Tokyo Disneyland aside, guests can trade with cast members in every Disney park. Pins are not new to the collecting arena. 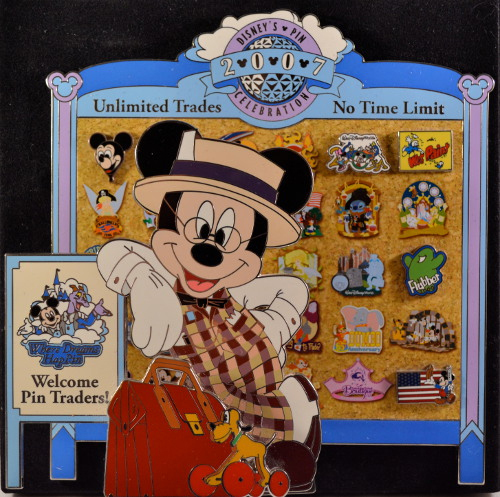 Before pin trading took off in 1999, pin collectors had been around for many years. The pins they collected were produced by a number of different companies each with a different artistic approach. These pieces now form part of the vintage family of pins. Pin trading is a relatively new concept in the world of collectibles. It has found its niche in the pin community and many serious collectors today began their journey as a pin trader. Pins are a hobby that the whole family can participate in, sharing and enjoying the timeless magic of Disney together. Make trades and make friends with people across continents while being a part of the fastest growing collectible scene around. if a pin catches your eye, we can help you make that trade. the world. Different people have their own unique collecting tastes but at PinPics there's room for everyone. It's so easy to get started and join the community, so get yourself involved! There are regular competitions, games, giveaways, and fun forums.